Explain an ideal gas cannot be liquefied ? For a gas to liquefy, it is necessary for the molecules to come close to each other. For that the gas should have inter molecular attraction. But in ideal gas, it is assumed that there is no inter molecular attraction and hence it can not be liquefied. PV = RT, it is possible to show that the critical temperature(TC) for ideal gas is 00K. or, Tc = 00 K.
Thus to liquefy an ideal gas, it is necessary to bring the temperature below 0K and it is not possible and so the ideal gas can not be liquefied. Find the density of ammonia gas at 1000C, when confined by a pressure of 1600 mm Hg. In the above problem molecular weight M = 17 gm mol-1, Pressure P = 1600 mm Hg = 1600/760 atm, R = 82.1 cc atm mol-1 K-1 and T = (273 +100)K.
Express the coefficient of thermal expansion(α) of a gas. Show that α depends on the temperature for an ideal gas. For Solution See Problem 1 of Comparison Between Ideal and Real Gases. 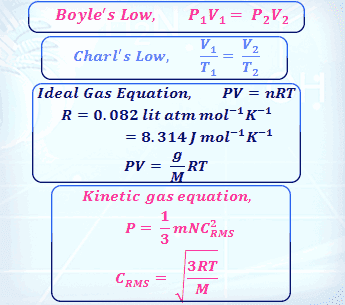 The compressibility factor Z of a gas is given by Z = PV/RT. What is the important of this expression ? The expression of Z provides the measures of non-ideality of a gas. It is the single parameter by the extent of non-ideality of a gas could be measured. Thus when Z = 1, the gas behaves ideally. But when Z ≠ 1, the gas behaves non-ideal and departure of the value Z from one measures the extent of non ideality of the gas. Thus the gas becomes more compressible than ideal gas. Again when Z 〉1, the gas is less compressible than the ideal gas. Show that Z is always greater than 1 for a gas obeying the equation P(V - b) = RT. What does the result signify ? From the above relation, Pb/RT is (+)ve thus Z 〉1. Why an ideal gas cannot have a reduced equation of state ? The reduced equation of state is expressed in terms of reduced variables like reduced temperature (θ) reduced pressure (π) and reduced volume (φ). where Tc, Pc and Vc are the critical temperature critical pressure and critical volume respectively. PV = RT for 1 mole. But the critical temperature of the ideal gas is 0°K , hence the critical state is not attain by the ideal gas since 0°K is unattainable. Since critical Constants (Pc, Tc and Vc) are not available for ideal gas, so the reduced variables (π, θ, φ) are also not available for ideal gas. Thus reduced equation of state can not be constructed for ideal gas. The root mean square velocity of Hydrogen is four-times that of Oxygen. For Solution See Problem 8 of Kinetic Theory of Gases. Calculate the pressure excreted on the walls of a 3 litre of flask when 7 gms of nitrogen are introduced into the same at 27°C. For Solution See Problem 4 of Kinetic Theory of Gases. Calculate the total kinetic energy of 0.5 mol of an ideal gas at 273 K.